Featuring a sleek slate teardrop design this 1 gallon (3.78 L) ultrasonic humidifier can produce up to 2.1 gallons (8 L) of moisture a day. This moisture can help relieve your child's nasal congestion, dry cough, and sinus irritation, so they can breathe easier for a good night's sleep. recommended to avoid white dust if tap water is too hard. Or you can purchase the Crane Demineralization Filters - sold separately. Do NOT use hot water. 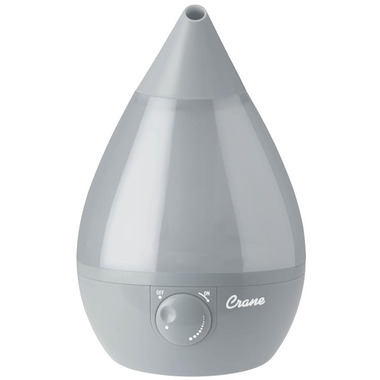 Would highly recommend this humidifier, no leaks and works very well! Excellent value!! Cool mist all night long and no leaks or drips like my last humidifier (which I paid almost double for!!). Would highly recommend this product for each bedroom during the winter -- excellent for helping with colds too! Unfortunately this humidifier did not work well. It spurts a minimal amount of vapour and then water leaks from the bottom of the unit. The instructions for the unit recommend the use of a towel-- this should have been my clue about water leaking. I strongly recommend buying another model of humidifier particularly if you have small children or pets. Easy to use and even on the highest setting it will put out cold mist for an entire night. Really helps us sleep in a super dry environment.